Today was meet the Barrett cousins day. We were expected at Norm’s house, Portarlington, before lunch to give us plenty of time to talk and tour the Bellarine Peninsular prior to meeting the other cousins at dinner time. We were amazed at how many vineyards were in the area, all boutique wineries with trendy little eateries attached. Also lots of canola grown in the district as well. Our first stop was at Queenscliff for a view of Port Phillip Bay and the Queenscliff/Sorrento ferries. The Rip was visible from here as well, although we had a much better view from the lighthouse at Port Lonsdale. A sign on the lighthouse warned that a siren would sound two minutes before the foghorn commenced and the area should be immediately vacated. The water movement (in all directions!) through the narrow opening was incredible – no wonder the Spirit goes up and down at this point! 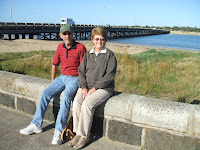 We continued to Barwon Heads, the town used for filming “Sea Change” and had our photos taken with the famous bridge in the background. Unfortunately, a rather yuppy restaurant has been built on the end of the pier next to Diver Dan’s boathouse. Dinner was at the home of Norm’s brother, Milton and his wife. Also present were Milton’s son, daughter-in-law and granddaughters. As everyone was interested in the Barrett history, I was able to give them lots of information and stories. At one stage, we even had our computers lined up – duelling computers?? ?